Pozzi A, Holst S, Fabbri G, Tallarico M. – Clin Implant Dent Relat Res. 2015 Jan;17 Suppl 1:e86-96. doi: 10.1111/cid.12132. Epub 2013 Aug 5. 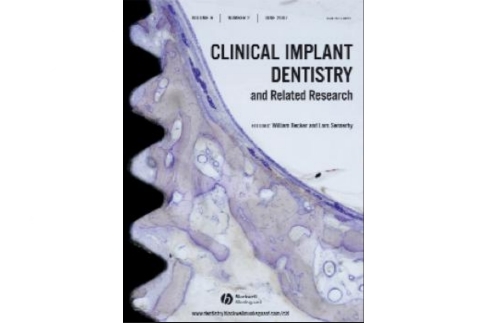 PURPOSE: The purpose of this study is to retrospectively evaluate the implant and prosthetic survival and success rates of zirconia-based, implant-supported, screw-retained, cross-arch restorations up to 5 years after placement. MATERIALS AND METHODS: Twenty-two consecutive edentulous patients (11 males and females, each; mean age 68.3 years) received 26 CAD/CAM cross-arch zirconia implant bridges (NobelProcera™ Implant Bridge Zirconia; Nobel Biocare AG, Zurich, Switzerland) supported by 4 to 10 implants each. All patients were followed for at least 3 years (range 36-60 months, mean 42.3 months). Clinical assessments were scheduled every 4 months during hygiene maintenance. Outcomes were implant and prosthetic survival rates, prosthetic success rate, any observed clinical complications, patient satisfaction, and soft tissue parameters. Fisher’s exact test was used to assess associations between categorical variables. RESULTS: No dropouts occurred. The overall implant and prostheses survival rate up to 5 years was 100%. Three out of 26 restorations (five out of three hundred forty eight dental units) showed an adhesive chip-off fracture of the veneering ceramic, scoring a cumulative prosthetic success rate of 88.5% at the prosthetic level and 98.6% at the unit level. All 22 patients were functionally and aesthetically highly satisfied with their restorations. Successful soft tissue parameters were found around all implants. CONCLUSIONS: Industrially manufactured, zirconia-based, implant-supported, screw-retained, cross-arch restorations are a viable alternative to conventionally manufactured porcelain-fused-to-metal restorations for rehabilitating the edentulous patient.